The challenge for regional planners and for developers will be to ‘link up’ the beaches on the east coast of Koh Phangan. When you look at a road map of Koh Phangan it will soon become apparent that there are no roads on the east coast of the island. 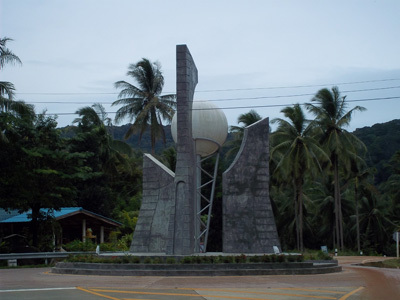 Instead there is the Baan Tai to Thong Nai Pan road that winds its way over mountains and through jungles. From this road a number of dirt tracks go down to such east coast beaches such as Than Sadet, Haad Yao and Haad Nam Tok. There are a number of footpaths joining up parts of the east coast. There is a path from Thong Nai Pan Yai to Haad Sadet, one going from Haad Rin Nok to Haad Yuan and one going from Haad Sadet to Haad Thong Reng. It is not impossible to walk up the east coast, beach hopping, but it is very difficult; and such an undertaking would be very much going ‘off the beaten track’. At first glance at the geography of the region, the notion of an eastern coastal road seems a challenge for engineers that might be prohibitively difficult and expensive. However, the same was said about building an airport at Than Prapad. Moreover, work is already underway creating a road that goes around Koh Phangan. The first stage is to finish concreting the Baan Tai to Thong Nai Pan Road. The next will probably be upgrading the Thong Nai Pan to Bottle Beach Road. Then it is likely that the road will be extended to Chaloklum. When this happens Thong Nai Pan will be easily accessible from the north of Koh Phangan. At that point the east and the west will be joined. If eastern beaches like Haad Sadet and Haad Thian become centres of hotel development there will be pressure to first provide better access roads to these beaches – The Haad Sadet road is already underway – and to build roads going north-south, not just east-west. These questions are partly the territory of land speculators who look to predict the future and get in on the ground floor. Opposed to the money incentive are those purists who love the east coast beaches exactly because they are hard to get to and cut off from the rest of the island.